Admit it, you probably sleep with your pet (pets?). Lots of us do. Sure we’ve all heard the warnings and cautionary tales about sleeping with them, but it doesn’t seem to stop us. In many cases, even allergy suffers fail to heed the advice of their physicians in order to accommodate their sleep preferences. It’s hard to say no to that adorable, furry little face when it comes time to turn in. And, besides, numerous individuals find it a comfort to have them onboard, so to speak, when the sleep train pulls out of the station. 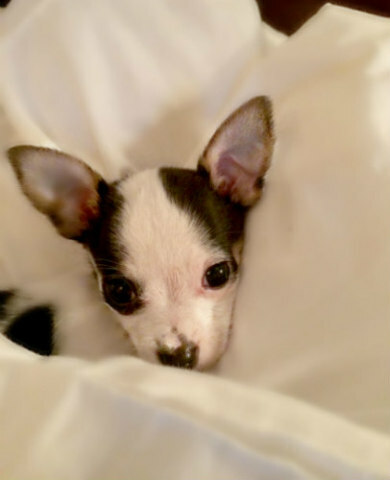 According to some stats on WebMD sourced from a survey conducted by the American Pet Products Association back in 2009/2010, 62 percent of small dogs, 41 percent of medium-sized dogs and 32 percent of large dogs sleep with their owners. It was also discovered that 62 percent of cats sleep with adults, and another 13 percent of felines sleep with children. While some serious questions have been emerging recently about early or consistent exposure to cats and mental health issues later in life, is it really that unhealthy to sleep with our pets? Yes, there are some legitimate concerns proffered by physicians in connection to sharing some sack time with four-legged friends. 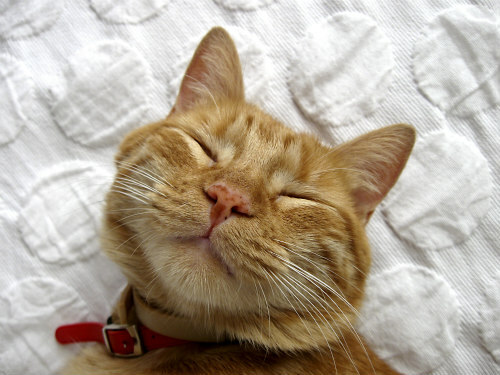 The most common is pet dander and hair being a potential irritant to allergy and asthma sufferers, as mentioned above. But it’s also not a good idea for people with lowered immune systems to sleep with pets, either. According to the journal Emerging Infectious Diseases, the risks of sleeping with your pets include exposure to dog-to-human bacteria and internal parasites like salmonella or heartworms, methicillin-resistant Staphylococcus aureus — aka mrsa — and meningitis. If you’re healthy, while the risk is still there, it’s not all that common to contract these conditions. If your dogs or cats are playing host to fleas and ticks, there is the very real possibility of your getting bit during your sleep. Believe it or not, the bubonic plague is still alive and well in some parts of the country and has even been reported in areas normally not associated with it. While it is treatable, it is still an extremely dangerous illness (especially if not caught early enough) you don’t want to mess with. Another real concern is Lyme disease, the debilitating neurological malady associated with deer ticks. You can get around both these worries by keeping up on your preventative care regimen for these nasty little bloodsuckers. Problem solved! 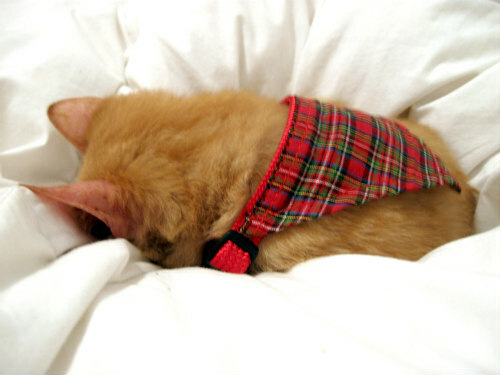 Sleeping with Pets: How could you say no to sleeping with this adorable face? For people prone to chronic sleep disturbances, it may not be the best idea to cuddle up with your pets at night. Often times they are bed hogs, they pin the sheets and covers down (making it difficult to roll over and re-position), or they snore — which is especially common with older pets and brachycephalic animals. If you have trouble sleeping in general, all of these things could lead to even less rest than the sleep deprived already receive. Lack of sleep results in stress, weight gain, impaired cardiac health and a weakened immune system, none of which are good for you. There are some concerns about behavioral issues on the part of dogs that sleep with their masters. Some vets, dog trainers and animal behaviorists feel that by sleeping on the same level as your canine pal you are unconsciously giving them equal authority and diminishing your role as alpha dog. It’s even been suggested that by carefully adjust your sleeping positions in order to accommodate your furry bedmate you are sending them the wrong signals and actually acting as their subordinate. If you've already established yourself as top dog and you reinforce this regularly, it shouldn’t be an issue. But the first time you witness irritable or aggressive behavior on their part, kick them out of bed. It could mean it’s time to consult with a professional. 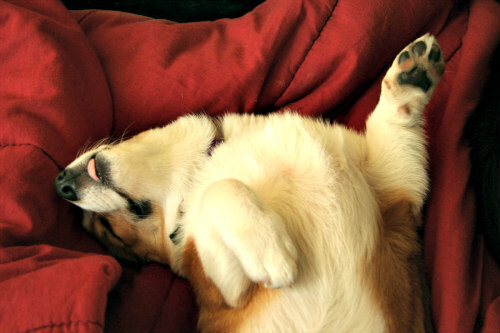 Sleeping with Pets: Or how could you say no to sleeping with this adorable face? Yes, you love it, and you wouldn’t have it any other way, end of discussion! 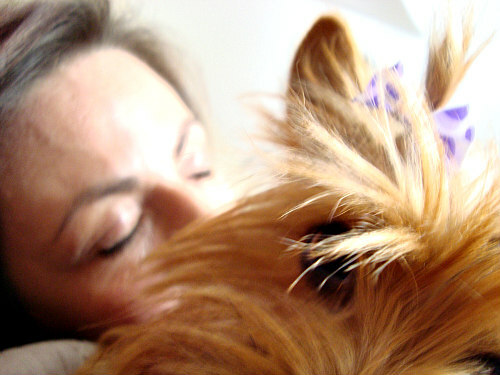 Well, there are actually some perceived perks of sleeping with your pets. While most professionals consider it harmless, many point out all of the known good points about it, too. There have been countless studies and observations on the subject of the wealth of emotional and physical benefits interaction with animals can have on us. They’re known to reduce blood pressure and bring about a feeling of calm. And reducing anxiety is only one aspect. It’s also been suggested that they help us to develop socially and might even encourage us to lead more active lives. All of these are definite pluses. Some people just feel safer at night sleeping with their pets, especially dogs. Yes, some cats can act as sentries, too, like Siamese cats, which are known for their loud, guttural moans when disturbed, but dogs generally make us feel safe — or safer. If you sleep alone in a home or apartment and the thought of your dog watching over you at night is comforting, then have at it. As long as you don’t meet any of the criteria for possible health hazards, as outlined above, then give your perceived guardian angel a lift up when it’s time to hit the hay. Another benefit of pets in general is their ability to help us deal with depression. Their unconditional love can make you feel better about yourself and give you something to look forward to on a daily basis. When the last thing you see at night and the first thing you see in the morning is that loving expression on their faces and the joy they’re experiencing just by being near you, it can only be a good thing. So, cuddle up next to him or her or them, if it makes you feel better. What better way to stay warm at night than a fuzzy blanket that emits heat? Dogs and cats can be great foot warmers and the perfect snuggle bunny on cold winter nights. Given the chance, they’ll curl up next to you and keep you warm as long as you’ll let them. Their presence beside you at night might even keep your electricity bill down, if you tend to keep your thermostat low in an effort to conserve energy. If you enjoy it, then leave the warming booties, heating pads and electric blankets in the drawers or closets and bunk with your buddy instead. Not everyone likes to cuddle. For those that do, nothing could be stranger than somebody that doesn’t. Some of us can’t even fall asleep at night without someone to spoon or be spooned by. If this is you, then cuddling your pet at bedtime might be all that you need to get a good night’s rest. The feeling of warmth beside you and the steady beat of a heart or the rhythm of their breath can be extremely soothing. When puppies are first being weaned, often times people will put a ticking clock and a fuzzy blanket in their crate with them in order to replicate their mother’s nurturing presence. There’s nothing wrong with this, and it could even promote bonding between the two of you, leaving you both feeling safe and loved. 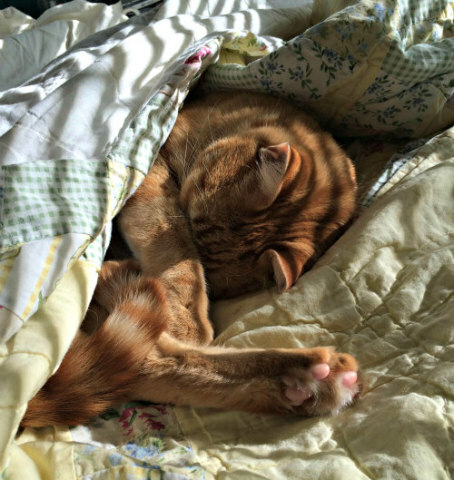 If you’re going to sleep with your pets at night, it’s probably a good idea to change your sheets and launder your blankets or comforters more frequently than if you sleep without them. After all, no matter your diligent grooming habits in connection to them, they are going to leave dirt, dander and hair in your bed. Even if you don’t already have allergies to this kind of debris, it doesn’t mean you can’t develop them later on through constant exposure to them. So, keep it clean and snuggle up tonight and don’t let the bed bugs — or any other disgusting critters — bite.